A wrist brace can be described as a garment that can be worn around the wrist in order to allow healing and protect it from all kinds of damage. Wrist braces for tendonitis protect against injuries that have occurred around the wrist and provide compression to the wrist bones. When Should You Use a Wrist Brace? While wrist braces for tendonitis can be very helpful in pain management, there is no one size fits all. What may work for one wrist may not necessarily work for another, but there are some basic features to using wrist braces that can help you chose the best brace for your condition. Sprains when a cast is not required. Fractures or breakage after the cast is removed. Carpal tunnel syndrome where wrist nerves cause pain. Any other wrist condition that affects daily living. Wrist braces for tendonitis can help improve risk injuries and reduce swelling as well as soreness. These braces are effective in stabilizing joints and making sure that extra movement does not take place. By doing so wrist braces allow an individual to carry out daily activities while improving the healing process. A wrist brace for tendonitis is also very useful for patients who have undergone surgery as it provides protection and improves the overall healing process. With this orthopedic device, you need not worry about pain or discomfort at night. In fact, a good brace with the right support will help you sleep better by not only protecting your wrist but also immobilizing it. In addition, the wrist brace is perhaps one of the most economical and simplest forms of dealing with wrist related issues. However, there are also some drawbacks associated with using wrist braces. For instance, that the brace can be uncomfortable to wear and may interfere with daily activities. Wrist braces also tend to get dirty, sweaty and smelly at times and require cleaning often on a daily basis. Occasionally, too much reliance on the wrists brace may also result in stiffness. Having said that, some people may find wearing a wrist brace for tendonitis all the time problematic and may not use it properly. If you don’t wear the brace as prescribed, you may only hinder the healing process and delay recovery. On the other hand, people may only wear the brace when in discomfort or abandon its use too early. This can also cause problems and make recovery slow. This wrist brace for tendonitis is lightweight and effective in reducing inflammation and all kinds of pain. The product can be adjusted according to wrist size and compression allows circulation to improve. The best part about this brace is that it’s comfortable to put on and allows daily activities to take place without causing any difficulties. It comes with a removable splint that provides flexibility and wrist support. The product also comes with adjustable straps that reduce pain, inflammation and swelling. Whether you have arthritis or any other similar condition, this product does wonders by making sure the pain is erased. The breathable neoprene allows the hand to be exposed to air and remain cool. The material allows the wrist to stay put thereby eradicating disturbances. 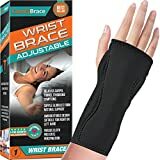 Customers who have used this wrist brace for tendonitis have found it to be comforting and have found it to be effective in dealing with faster wrist recovery. Parents have also reviewed the product and said that it allowed children to normally carry out activities by providing necessary support and reducing wrist pain. The purpose of this wrist brace for tendonitis is to make sure you are provided comfort and support together. It also aids in reducing the pain, swelling and any kind of wrist soreness you may experience. With this wrist brace on you can still carry out your daily activities as it is designed in a way to allow you to. This product comes with a strap that can be adjusted according to the size of the wrist. Even if you have slender wrists, this product will still fit you and stay put. The wrist brace allows movement to take place while ensuring stability at the same time. The product is made using latex-free recycled material and holds anti-microbial properties. Customers who have used this tendonitis wrist brace have found it to be lightweight, breathable and comfortable to use. Customers have also mentioned that the product is inexpensive and easy to use. Those with carpal tunnel pain have specifically said that it helps eradicate pain and allows movement without having felt any kind of discomfort. This wrist brace is a perfect must-have for athletes. Designed specifically for people who lift, this product can assist you when you work out at the gym. People who lift are likely to come across wrist tendonitis and this wrist brace will help you deal with it. The purpose of this wrist brace is to help support your wrists and provide stability. The product comes with adjustable straps that allow the brace to stay put. It is made using top grades and contains durable Velcro. This wrist brace is easy to use and can be worn without going through the hassle. Despite being stiff the product is very comfortable to use. Customers who have used the product have found it to be comforting and perfect for gym purposes. They have found the product to be highly supportive in providing stability while at the same time delivering comfort. The wraps are well made and keep wrist stress under control as stated by the customers. 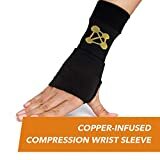 This product consists of copper compression wrist sleeves that can help remove joint pain and improve overall blood circulation. The product supports mobility while reducing inflammation and pain. The wrist brace is for all types of lifestyles, whether you are an athlete or worker, this product is for you. This wrist brace for tendonitis is made from fabric that will prevent sweating and is odor free which means you can wear it without being smelly. Even in high temperatures the fabric protects the skin from being damaged and provides a comforting experience. The product is suitable for all ages and can make you feel great by improving overall muscle performance. The wrist brace is easy to use and allows you to carry out activities without getting off. Customers who have used the product have found it to be effective and satisfying. They have said that the product has given them a very comforting experience and works well with carpal tunnel pain. Customers have said that within minutes of use they felt their pain had reduced. Perfect for those suffering from wrist conditions, this wrist brace for tendonitis is a must have if you wish to get instant relief. With this brace, you get the essential wrist support required and improve your overall hand movement. The product fits perfectly and is easily adjustable allowing the hand to be supported nicely. There are a hook and loop that come along allowing you to adjust the fit according to your hand size. The product can be used on both hands and will facilitate the desired requirements. It is very easy to use and provides comfort ensuring that the pain is reduced. The wrist brace is very soft and comes with cushioned beads that provide guaranteed comfort and is made from breathable material. 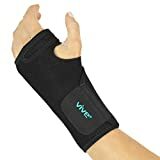 Customers who have used this wrist brace for tendonitis find it to be highly comforting and effective in dealing with carpal tunnel syndrome. Customers have stated that the product is suitable for use at all times and stays put providing all necessary comfort and support needed. They have also talked about the beads that the product contains which allows them to easily carry out tasks such as typing/ texting easily. These are some of the best-selling wrist braces for tendonitis on the market that can provide the comfort needed and make your wrists feel better. Choose a brace that will ease the discomfort caused by everyday activities.